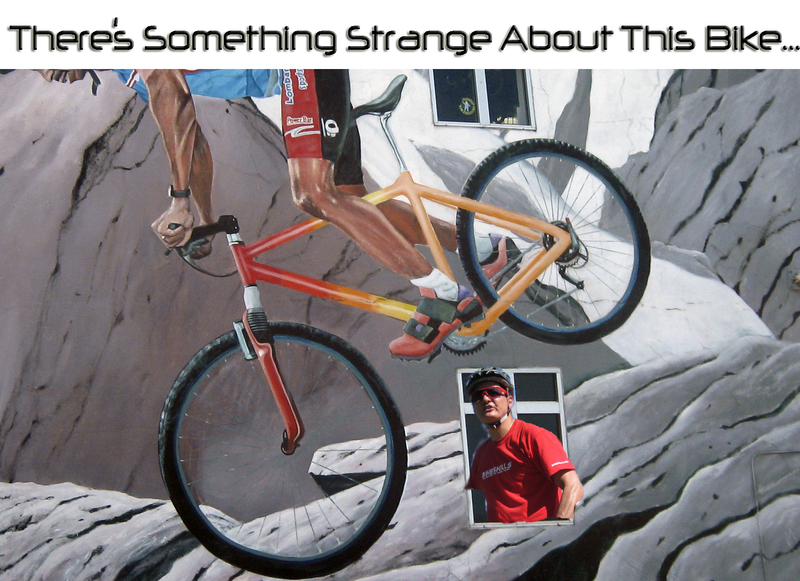 Every now and then we catch an advertisement or other image of mountain biking that’s well… off. 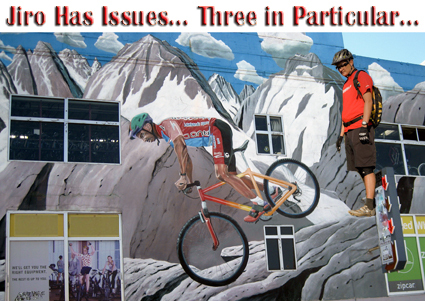 What’s interesting about this one is that it adorns the outside of a pretty well known sports shop, one very close to the self-proclaimed “birthplace of mountain biking.” Rather than make negative comments, we’ve got a challenge with rewards for our readers. Bikeskills’ Jiro Nakamura spots three fundamental “rider” problems here. We’re not going to give the answers away, but we will give you hints for the specific “don’ts” that we have in mind. 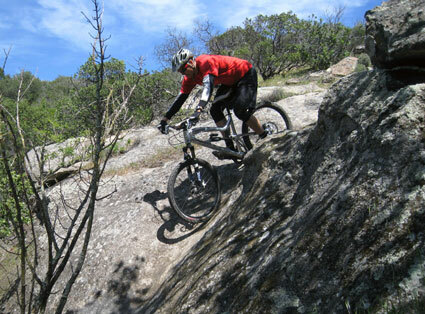 The first relates to the first thing you do before you head down hill or steep section of the trail. If you need a bit more help on that one, watch former World Champion Joe Lawwill in this steeps video and listen to what he says is the first thing he does before he before he attempts going down a steep section. Let’s assume that he does not go over the bars and land on his head. What should he have on that might lessen or prevent injuries? Joe’s (middle photo) got em. Jiro’s (on the right) has got em too. 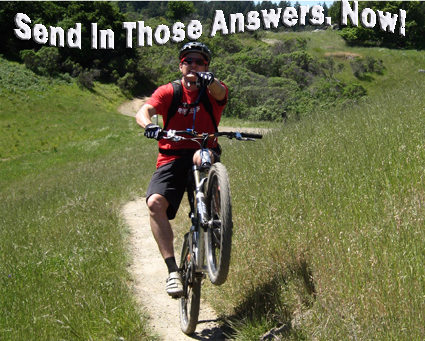 Answer “have what on?” and you have our third and final rider answer. Next up: what’s wrong with this two-dimensonal bike? If you can name three things (we can see four, so three of the four we see…) that are missing on this bike (click on the image above and you’ll get a jumbo view) and figure out what the three things things that are messed up with the rider (questions above) and are one the first eight people to get all the answers right, you can attend one of Jiro’s next clinics (more dates to be posted by 16 April 2010) at Camp Tamarancho or the Rockville Bike Park for FREE. You’ll also be awarded a FREE Genuine Inflator. Wait, there’s more; you’ll also receive, FREE of charge, your choice of a couple of WTB inner tubes or a pair of their sweet lock-on grips when you show up for the clinic. 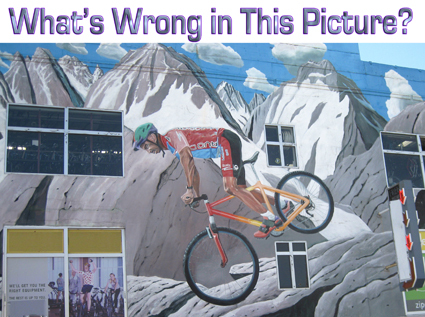 1) Name the three things that are wrong with the Rider (and bike adjustment) in the image at the top of the page: what’s the first thing you should do when attempting a steep section of the trail? What is the two-part movement you need to do when the trail starts pointing down? What’s a good thing to wear to help lessen or prevent injuries the rider in the image above isn’t wearing, but Jiro and Joe are? If you get em right, are one of the first eight people to do so, we’ll let you know and sign you up for a clinic.